(TibetanReview.net, Feb09, 2018) – Not sure whether the general apology it had issued on Feb 6 would suffice to assuage a not easily forgiving China, German auto giant Daimler has on Feb 7 issued another apology, this time in a letter to the Chinese ambassador to Germany. The company’s luxury brand Mercedes-Benz had sparked an outcry among mainland Chinese netizens over an Instagram advertisement post which quoted Tibet’s exiled spiritual leader, the Dalai Lama, who Beijing insists is a separatist. 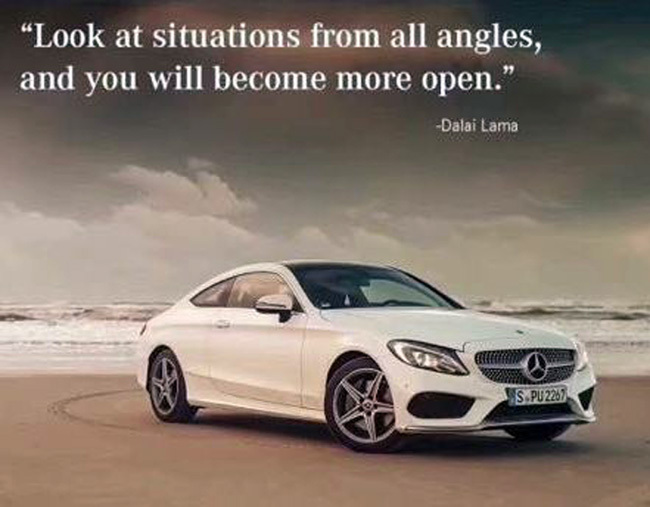 The Instagram advertisement post showed a white car on a beach along with the Dalai Lama’s words, “Look at situations from all angles, and you will become more open”. The second apology, which was in the form of a joint letter from Daimler chairman Dieter Zetsche and the company’s China chief Hubertus Troika, expressed “sincere apology to China” and sought to assure that Daimler had “no intention of questioning or challenging in any manner China’s sovereignty and territorial integrity”, reported China’s official Xinhua news agency Feb 8. Xinhua further quoted Daimler as saying it “deeply regrets the hurt and grief that its negligent and insensitive mistake has caused to the Chinese people”. The second apology in two days highlights the extent to which foreign companies try to appease the authorities when they run afoul of the party line of the world’s second largest economy, noted the AFP Feb 8. Instagram has long been blocked in China and Mercedes deleted the post on Feb 6 right after drawing criticism from Chinese internet users who were most likely government-approved net activists with unbridled access to an otherwise tightly controlled internet. Mercedes had issued its first apology on China’s Twitter-like Weibo social media platform, saying it was sorry to have “hurt the feelings of people of this country”. China’s foreign ministry had welcomed the company’s initial apology, saying “recognising and correcting one’s mistakes is the most basic of ethics”. However, the official People’s Daily had said Mercedes had made itself “an enemy of the Chinese people”, which apparently prompted the second, even more self-demeaning apology.